Approximately 22 species in Santa Cruz County. 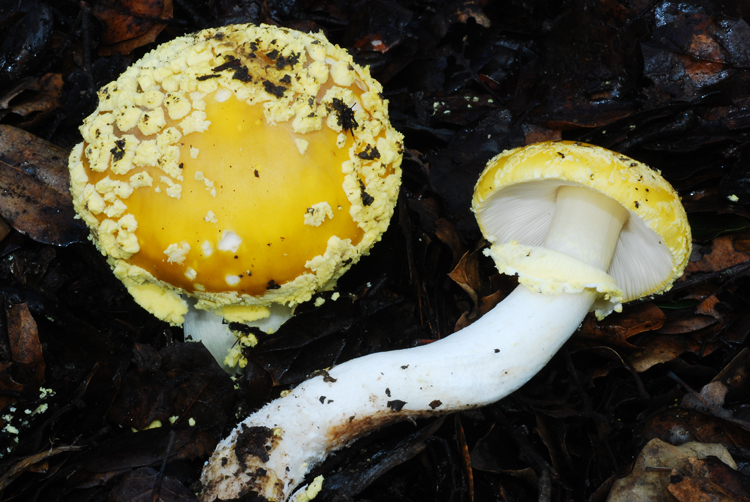 Amanita contains some of the most beautiful, conspicuous, and well-known mushrooms in the world. Universal veil remnants are frequently present on the cap (as warts or a skull patch) or at the base of the stipe (as a volva), and in most species a partial veil is present on the stipe. 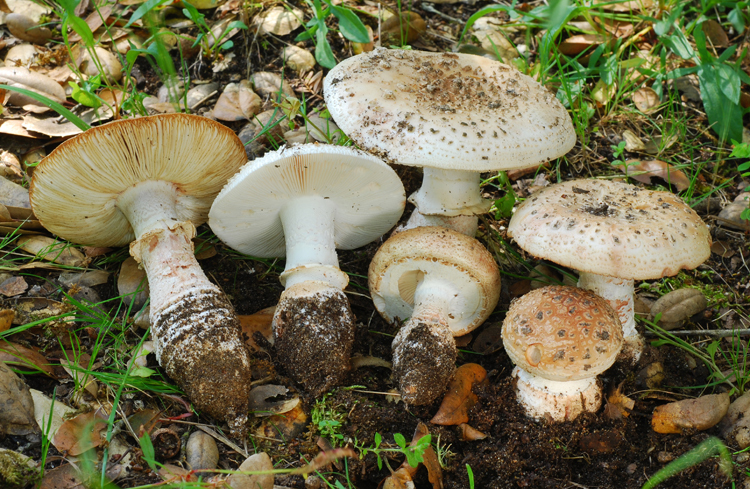 Almost all species are ectomycorrhizal, forming associations with a wide variety of hosts. Very few species are nonmycorrhizal. 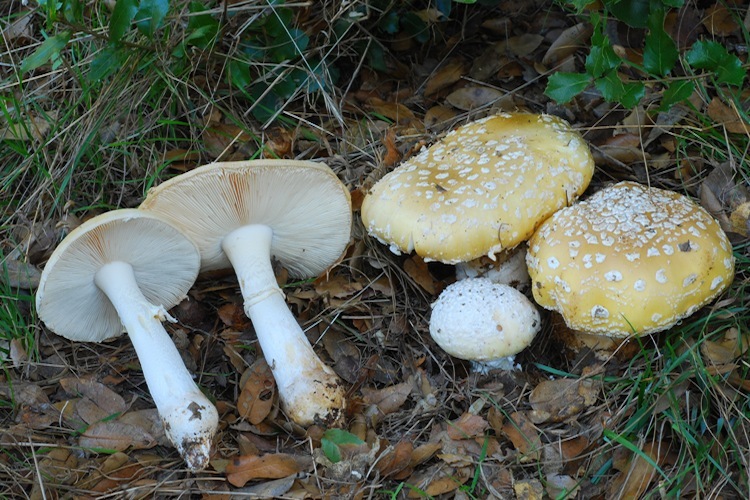 Amanita is equally famous and notorious for containing many delicious edible species (A. velosa, A. calyptroderma, A. vernicoccora, A. pachycolea, etc. 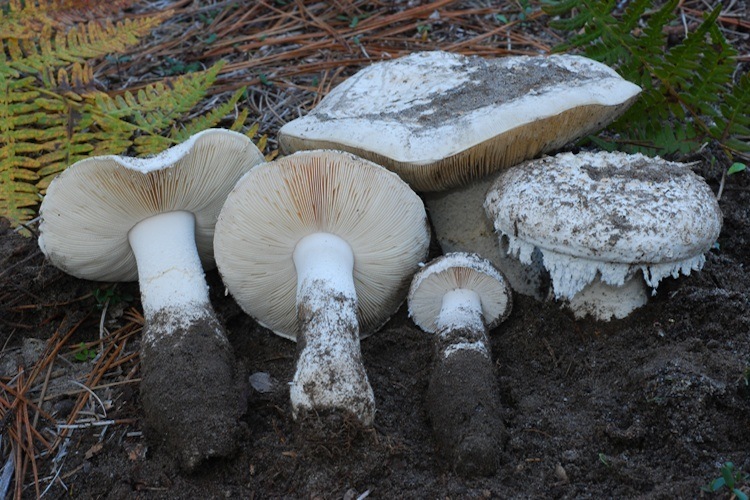 ), as well as deadly toxic species (A. ocreata, A. phalloides). 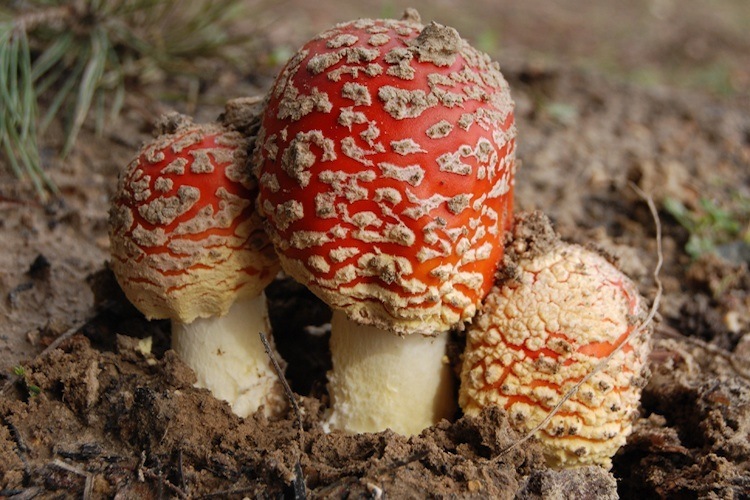 There are five sections within the genus Amanita, members of which can look very different from one another. Section Amidella – rare in our area, one unconfirmed species. Members of this section have a saccate volva, amyloid spores, and often bruise reddish or pinkish when cut. Section Caesareae – large, robust fruitbodies with striate-sulcate cap margins and hollow stipes, and well-developed universal veil tissues. Most if not all are edible. Section Lepidella – fruitbodies most often large, usually entirely white and without any contrasting pigments, but often discoloring yellowish in age. Veil tissues poorly developed and often very powdery and messy, leaving residues on surrounding leaf litter. One species in our area is not ectomycorrhizal with woody plant hosts (A. singeri). 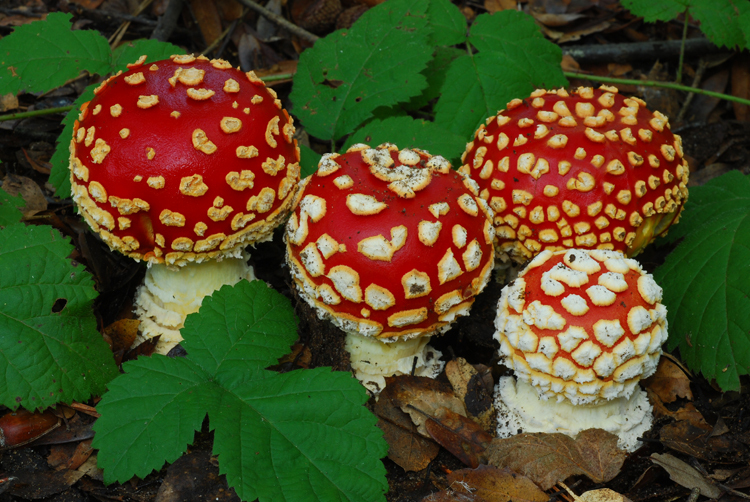 Section Amanita – the iconic Amanita muscaria is in this section (notably, the type species for the genus). Most have strongly warted and brightly colored caps, and concentrically-ringed and scaly or tight cup- or collar-like volva tissue. Most species toxic, often containing ibotenic acid and/or muscarine. 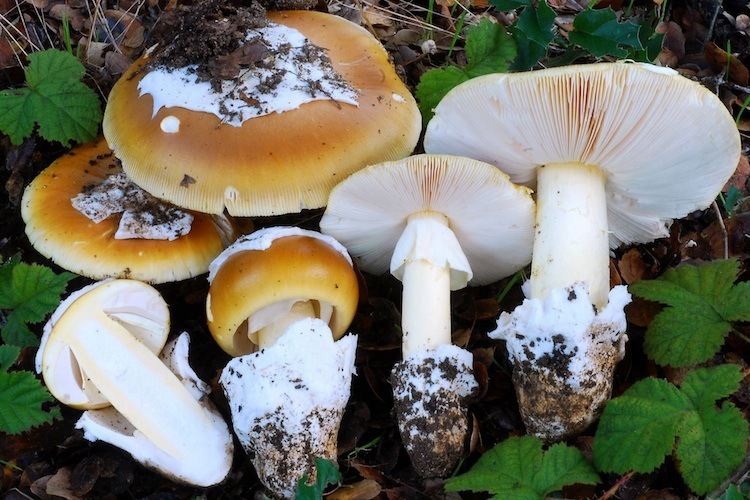 Section Phalloideae – The most deadly mushrooms in the genus (those that contain Amatoxins) are in this section, including the Death Cap (Amanita phalloides). Cap usually bald and unstriate, volva usually saccate, base of stipe often strongly bulbed. Spores amyloid. Section Vaginatae – caps sulcate-striate, usually gray to brown (one pinkish), partial veil absent, volva and universal veil tissue on cap usually staining rusty orange. Taxonomy complicated. All known species edible. 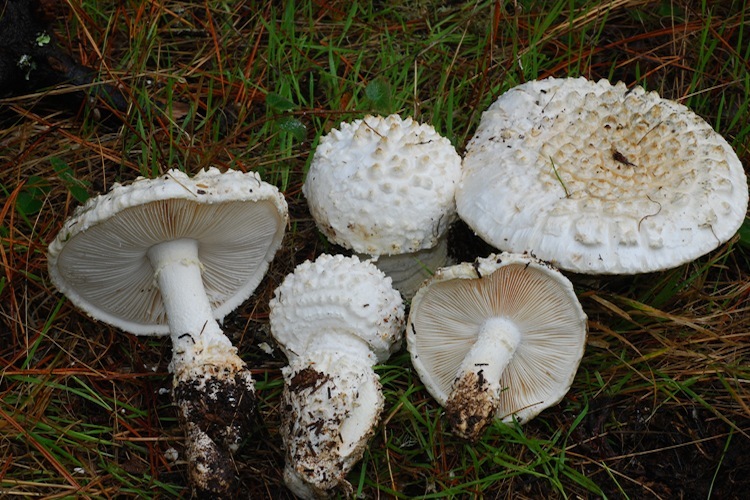 Section Validae – whitish colored fruitbodies, variably staining reddish or just brownish, the volva is usually weakly developed, spores are amyloid. Important identification characters include overall coloration and stature, presence and distribution of universal and partial veil tissues, striations, stipe shape and ornamentation, and host tree.